Join the discussion on our forums! 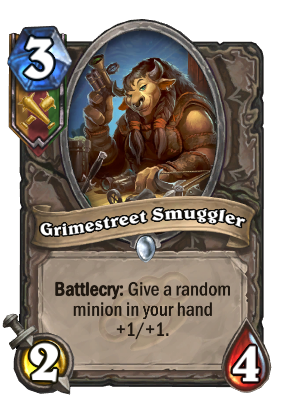 Come discuss Grimestreet Smuggler over in our dedicated Grimestreet Smuggler discussion topic. Amazingly good card for a 3 Mana generic common card. 2/4 for 3 mana IS good for a 3 mana drop, not every minion should have 3/4 stats for 3 mana, you know. The Battlecry is random but by giving +1/+1 to a minion that you'll play on curve can be game-deciding because this card on turn 3 isn't a tempo loss at all. It's a really good arena card, in constructed will not see much play however. It FEELS like a reprint of Shattered Sun Cleric to me, but on closer inspection it trades better at a cost of making your board stronger and instead gives more potential to what's in our hand. I can see this being used in faster aggro/battlecry based decks? Stop making crappy cards like this. Just filler tier crap. That's because it is, unfortunately. Well it could be playable as a tier2 choice in arena. In constructed it's not good enough with no direct impact on the board and average stats. This is a multiclass card for paladin and hunter though. It is not meant to work alone. This is weak, neutral common filler trash. Not creative enough for a tri-faction/tri-class card. I could see both copies played in MidRange Pally, if that can be a thing. It is both a minion that can benefit from buffs and it buffs another minion. As an on-curve play it is an awkward card to Eviscerate, Shadow Bolt, or Truesilver Champion, and if it eats a 2 card combination it is okish as it either opens the way for another minion and lessens the amount of super efficient removal your opponent may have. Maybe this could be teched as a 1 off if Taunt Arcane Giant Warrior is a thing, or if somehow Midrange Hunter decides that the Secret engine is not good enough for the meta it could also run this card, again as a curve play to make the other on curve minions harder to answer to. A bit of RNG so good in Arena, in Constructed probably for a taunt or buff-heavy deck. Hey! A female Tauren! That's the second one in the game, right after Sunwalker! Why another 3-drop? Warrior need good 1 and 2-drop minions. It's so boring to never be able to play something turn one and fall behind tempo against aggro. This is the discussion page for this card in warrior, there are two other pages for Hunter and Paladin.